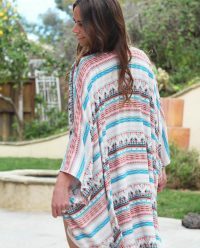 Oversized boho kimono coverup with tribal print. Comfortable with an easy going yet stylish look. 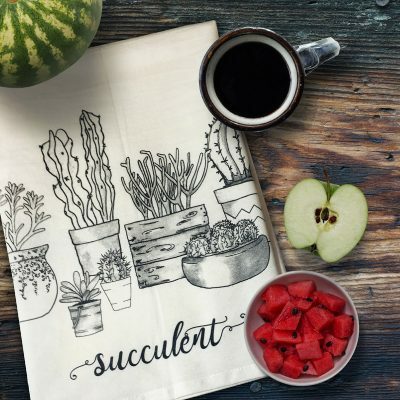 It goes great with shorts and tank top, leggings and sports bra, jeans and t-shirt, mini-dress, or as a cover-up over bathing suit or lingerie. 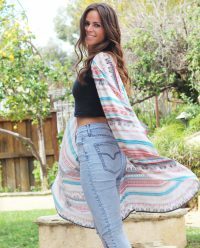 Inspired by the Bohemian lifestyle and fashion, this tribal print kimono coverup is loose fitting with lots of movement. It is comfortable with an effortless yet stylish look. Throw this on over a pair of shorts and tank top, jeans and t-shirt, summer dress, leggings and sports bra, or your favorite lingerie. It is so easy to style. This kimono has been prewashed, preshrunk, and it is easy to care. Just machine wash, dry, put it on and you’re ready to go!